Would you wait for your car’s engine to break down before you decided it was time to change the oil? Of course not. 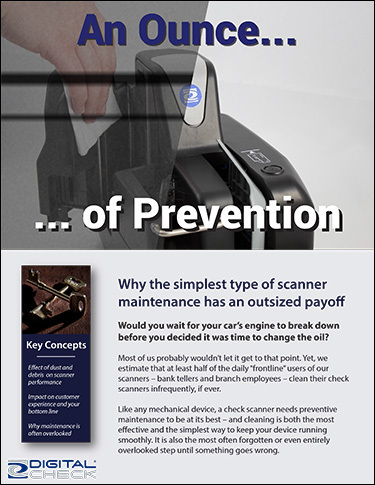 But for whatever reason, it doesn’t occur to many people that a scanner, just like any other mechanical device with moving parts, needs routine maintenance if you expect it to run properly in the long term. A simple cleaning is perhaps the most important – as well as the most cost-effective – step you can take to keep your equipment operating smoothly. In this paper, we examine the most common types of issues that arise from dirt, dust, and other buildup in the scanner track, as well as the cost/benefit calculations of addressing them (or not). We also take a look at several reasons why scanners today are maintained less frequently than their counterparts from the past – and why they even tend to come into contact with more unpleasant contaminants from the environment than they did previously. We hope that after reading this, you’ll be inclined to open up a cleaning card and give it a few passes through your device on a more regular basis.